3 localities visited by Buzun. Main feature suggesting heuglini in these pictures from Tampere, Finland is upper-parts grey-tone. Buzun (2002) has examined 50 adult birds and presented his findings in the table that is reproduced below. Heuglini are obvious paler than nominate fuscus and the data provided by Buzun indicate that heuglini is also slightly paler than graellsii. Heuglini lack the bluish tones which are characteristic for argentatus, but old feathers in summer may appear brown-hued. The primary pattern of heuglini is close to what is known for other member of the LBBG complex, i.e. with much black in the wing, but combined with a white mirror on P10. The mirror on P9 is normally absent: 30% of Buzun's sample has the P9 mirror reduced to the outerweb; only 8% has a P9 mirror that covers both webs. Black in the outer-wing is extensive: only 5% of the birds (Buzun, 2002) show black on the outer six primaries, all other birds have black on seven or eight primaries. Interestingly, the base of the inner web of P10 is often white or off-white, reminiscent of cachinnans  although this taxon has a much larger white tongue of course. A white or whitish base was recorded in over 70% of the sample; about 30% showed a grey base. table 1 (Buzun, 2002): Indices of mantle colour of 'West Siberian Gull' Larus heuglini antelius from Kanin, the Russkii Zavorot peninsula and the Gulf of Ob, Russia (Kanin sample includes one individual from northern River Dvina). Terms used for colour shades follow Ridgway (1912). Notes: mantle shade of total sample between Kodak grey 8-13. The results of wingtip pattern research are presented in table 2. According Buzun, heuglini has more black-marked primaries than other slaty-backed taxa. However, research on adult breeding graellsii LBBG at Moerdijk, Netherlands, shows that the figures are almost identical. Normally (in about 95% of the birds) the division between pale inner web and distal black on P10 is a straight line (not convex or concave) and sharply demarcated. table 2 (Buzun, 2002): Classification of wingtip pattern types of 'West Siberian Gull' Larus heuglini antelius from the Russkii Zavorot peninsula and the Gulf of Ob, Russia. Type 1: Two large, open mirrors; distal mirror connected with white tip of the feather. Type 2: Large outer open mirrors; white tips discernible. Type 3: Mirror closed (surrounded by black) on outer web; white tips not present, or present on outer web only. Type 4: Mirrors closed on both webs. Type 5: Only one closed mirror (often on inner web). Type 1: Two large mirrors (but always smaller than those on P10); outer mirror frequently not entirely surrounded by black (open). Type 2: Small, closed mirrors. Type 3: Closed (or, less often, open-ended) mirror on only one web. Type 4: No mirrors present. Iris: Only 5% of heuglini handled by Buzun has a complete yellow iris. Another 29% has only limited pigmentation (covering 2-5%), so these birds look pale eyed as well from a distance. Two third of the birds has obvious pigmentation, either patches of grey, black or occasionally brown pigmentation. The average pigmentation coverage is 23.4% (S.E.=3.9; n=39). rauste, checking heuglini at Archangelsk estimated that 80% has some dark speckling in the iris. Orbital ring: 80% has a coral red orbital ring; 15% has a mixture of red and orange and the remaining 5% has orange or even yellow-orange orbital rings. Leg colour: This is difficult to discern, as the legs are not uniformly coloured. About 92% has yellow (pale yellow, lemon0-yellow or ochre) legs; the remaining 8% has some grey in it. 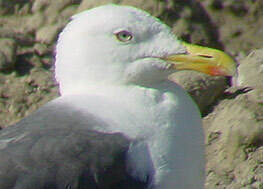 Bill colour: Yellow bill with a red-orange gonys spot on the lower mandible. 22% has some black on the bill in the breeding season (n=37). However, it appeared that most of these breeding birds with black on the bill are in fact young adults and only 8% of the really mature adults have some (limited) black on the bill. According Buzun, red on the upper mandible may be a vestige of what was formerly black, and therefore occurs predominantly in young adults (4 year old). 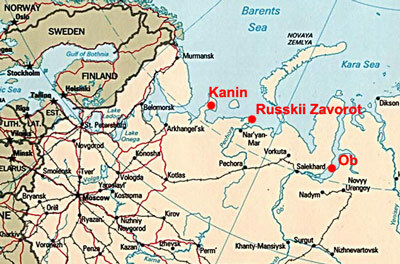 Adult birds on the Russkii Zavorot peninsula start the primary moult (shed P1) between 20th June and 20th July. Thus, there is a one month variation, and there proved to be a difference between marine island breeders (late moulting) and birds nesting on the tundra (earlier moulting). By mid-July, P3 is moulting in marine populations, and P4 (or even further) is moulted in tundra populations. All rectrices and secondaries remain old in July. Stresemann & Stresemann (1966) mention the commencemnet of primary moult in July-August, and describe that moult is arrested for migration. rauste (1999) checked adults in June and found that a very small portion (2-5%) already started primary moult (P1 / P1-P2 dropped) by 12th June. rauste presents also figures from September, see table below. Table 3 (Rauste, 1999): Primary moult status in September. Data from Archangelsk, Russia from 1 to 4 Sept 1998. Sub-adult birds may be included. Analysis from photographs. General structure, especially head-shape and bill with flat gonys angle, reminiscent of cachinnans, is often a good clue for identifying heuglini. Also, the facial expression is different: with slender bill and ideally with ill-defined gonydeal angle, reminiscent of cachinnans. However, there seems to be much individual variation. Buzun mentions the fact that females can be relatively heavy, long winged and with a long skull. At first glance, such birds are labelled 'male'. When all features mentioned here are present in one single bird, such individuals are probably relatively easy identified. However, pale LBBG birds at Tampere often do not show this ideal combination of characteristics. 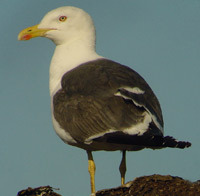 Hence, some birds may also represent the paler end of fuscus (so not heuglini), or, considering the pot-bellied, short winged appearance, one may also argue this is the intermedius influence in core fuscus breeding area. Interestingly, in recent years, some ringed pullus within core fuscus area, turned out to be rather pale grey (near)adults. Buzun V.A., 2002. 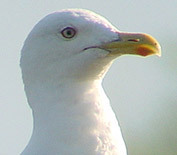 Descriptive update on gull taxanomy: 'West Siberian Gull'. British Birds 2002/95. Rauste V., 1999. 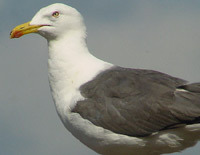 Kennzeichenund Mauser von "Baltischen Herringsmowen" Larus [fuscus] fuscus und "Tundramowen" L. [fuscus] heuglini - Teil I. Limicola 1999/13 Heft 3. Stresemann E. & Stresemann V., 1966. Die mauser der Vogel. J. Ornithol. 107 (Sonderh.). Heuglini adult, August 30 2010, Maagan Michael, Israel. Picture: Amir Ben Dov. Heuglini adult, August 2002, Tampere, Finland.